It all starts with grass-fed chuck roast, then we add in vegetables to round out the flavor. 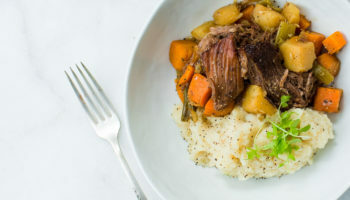 Like any pot roast, this recipe takes a while to cook, but it’s so worth it. Brandon is a slightly paleo locavore and the production manager at The Good Kitchen. He can skin and dice butternut squash in record time and has prepped thousands of pounds of local produce without blinking an eye. Brandon has over a decade of experience working in professional kitchens and has been a part of The Good Kitchen team since the beginning. He works with The Good Kitchen marketing staff to produce delicious, healthy recipes the everyday chef can use. He’ll never turn down a pot roast, but has been known to eat up the vegetarian eggplant lasagna.